I'm now back in the office full time after the Christmas break so of course the painting has slowed a little but this week the English get some attention after all the work on those Frenchmen. As mentioned on some of the earlier posts the Perry Miniatures French and English boxes are very interchangeable with the English archers being typically much less armoured than the French infantry. With this batch of archers I did a lot of mixing up of French bodies and heads with the archer arms and a lot more armour is included on these. Some are still made up of only the English bodies and arms but this batch should give you an idea of the possibilities with mash-ups between the sets. The figures are painted with a black and gold theme, again, not maintaining a specific livery but a common limited palette to bind the figures into a unit but not to have them overly uniform. The figures are based on standard 20mm Renedra rounds and mounted in the Warbases custom trays that I ordered - I've just contacted them for another batch as I'm running very low on the infantry trays now. In this group of four the second figure in is a heavily armoured French body with both a mail coif and plate armour for his legs. The third, lightly armed, figure with the dagger is entirely from the French set apart from his sheath of arrows and small shield. The figure on the left is another use of the heavily armoured French body while the shield on the third bowman is from the French set. The final figure is a French body and head with English arms, a good dynamic pose that is not available in the English set, he also has metal greaves. The first three members of this group are made from French heads and bodies with English bowman arms. The final figure is an English body with a French head. The option to have additional choices of bodies and helmets does get a lot of extra value out of these two sets. As ever with the Perry plastics they go together very well and need very little cleaning up and filler in preparation and paint up easily. 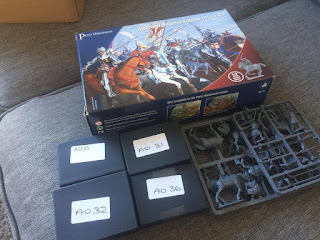 I'm working on more English bowmen and some French commanders, but this arrived in the post today so I may get a bit distracted.